I use to follow the formula one races but I really never envision myself in catching the real thing live. This all changed when my brother Jim called me. He got to borrow a pass for the 2011 Singapore Grand Prix practice session. All that I can hear was the high pitch roaring engines, screeches of tires and the zooming sound as the cars pass by. Even before I hear Jim saying anything, I knew where he was and right then and there I set my sights on watching the race a year after. I purchased our tickets through Ticketworld, a letter of authorization was forwarded to my email and I just had to print and present it at the Ticket Collection Point in Singapore to claim my tickets. It is best to purchase your tickets early to avail of the early bird rates. I got the Three Day Zone Four Walkabout tickets six months ahead of time. The three day deal got sold out months before the scheduled race dates. 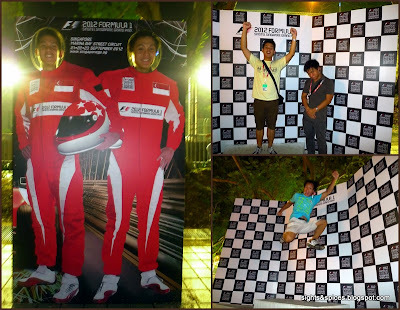 When we got to Singapore, the whole country felt so festive, the F1 fever was radiating all over. Singapore can proudly boasts of being the only country to hold the races at night. We wore our ID tickets and excitedly made our way to one of the entrances that we are allowed to enter. Everything was so orderly, getting in was so easy. I initially thought that the Singapore Grand Prix would only showcased the formula one races and the concerts. But to my surprise, there were a lot more. Different stages were set up to showcase various performers from all over the world. Drop dead gorgeous models danced to the beat of bongos and drums around the area, imitating the Carnivale in Rio. In one area, there were vintage cars on display. Complimentary formula one henna tattoo designs.The lines were long, we decided to pass on this. Formula one driving simulators. We also didn't get a chance to try this out though the people who did looked like they were having a blast. Team souvenir shops sells everything from key chains, shirts, stuffed toys and many more. There were different races but the main event was the Formula One races. Three days of adrenaline pumping high speed races. The first day, Friday is practice day, it gave the drivers an opportunity to go around and get familiar with the track. Saturday is the qualifying race, the race determines the starting grid order of the drivers for Sunday's race. Sunday is the race day itself, winner takes all. Crowd anxiously waiting for the Cars to Zoom by. There are 12 racing teams with two drivers each. Here are the teams. Taking pictures of the formula one cars was a challenge, we were using a point and shoot camera (LX3) and it was really hard to pan and capture the race cars. Luckily my brother Jon was patient enough with taking pictures. We got a few passable shots. Important note: One has to bring earplugs! It is LOUD. And you don't want to have the hassle to cover your ears every time the cars passes by. There are booths which sells earplugs all around the area. The winner of the 2012 Singapore Grand Prix and who also won the World Championship, Sebastian Vettel. The Red Bull Racing Team are the Constructors Champions as well. Everyday after the main races, there is a Concert that is headlined by three famous international artists. On Friday, Jay Chou took the stage. We're really not familiar with Jay Chou thus we didn't really stay to watch his concert. 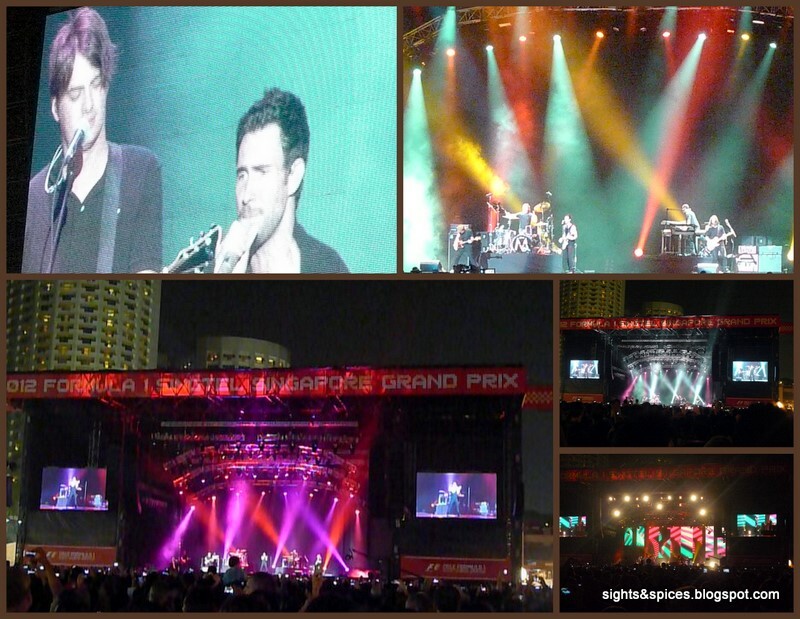 On Saturday, one of my favorite bands of all time, Maroon 5 played to the crowds delight. They are amazing playing tunes from different genres. 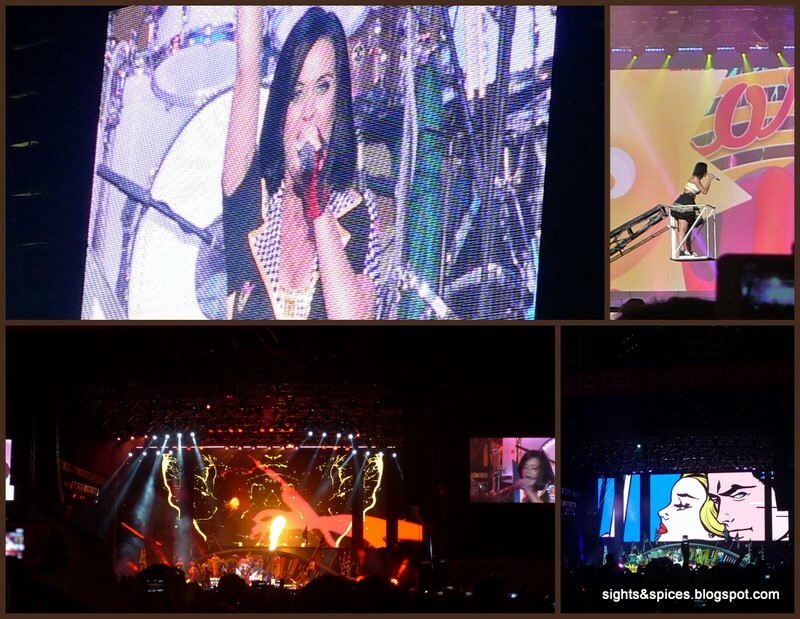 On the last day, Katy Pery entertained the crowd with her colorful and playful routines and songs. She commanded the stage really well, she was the perfect choice to end the event with a bang. I've heard people saying that watching a formula one race is a waste of time and money since the race cars would zoom by so fast that you wouldn't really be able to see anything. Although this can be true, the experience of hearing and actually feeling the power of the race machines is inexplicable. One has to be physically present to experience it. 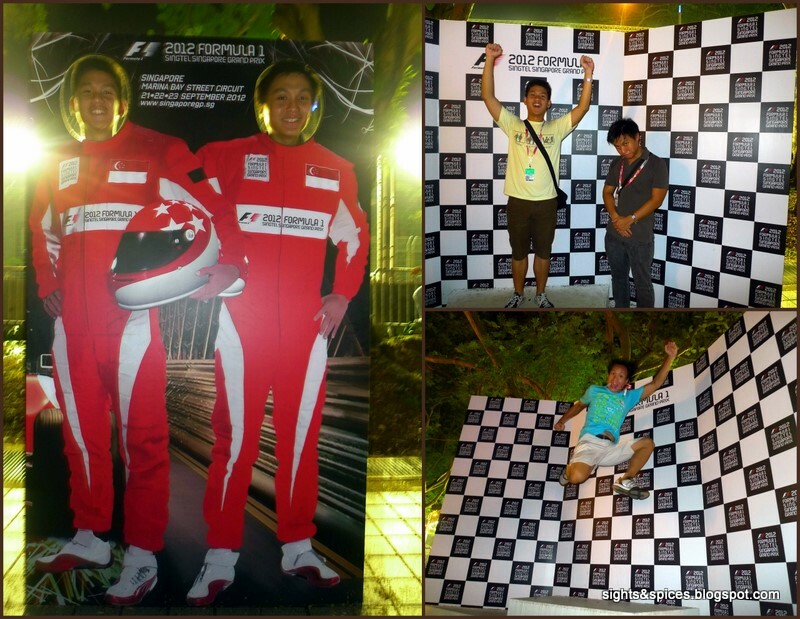 Moreover, the Singapore Grand Prix is not just about the races, it was more like a big festive celebration. Till our next Grand Prix Experience! I was surprised that we did!! !